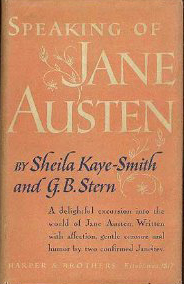 There is no doubt in my mind that Speaking of Jane Austen (or Talking of Jane Austen) by Sheila Kaye-Smith and G.B. Stern will find its way onto my “Top Ten Books of 2013” list at the end of the year; the only question is what position it will occupy. Were I to make that list today there would be no doubt: it is far and away the best thing I have read in 2013. I always enjoy reading other people’s thoughts on Jane Austen and, goodness knows, there are more than enough books and blogs out there to make even the most rabid Janeite happy. My preference has always been for personal, informal lit crit: Sylvia Townsend Warner and Margaret Kennedy both wrote wonderfully intelligent and personal books that highlight both Austen’s technical genius and the kind of intense relationships her readers form with her characters. Speaking of Jane Austen falls in this same category but is quite honestly so much more detailed and joyful than anything else I have ever read on Austen that it deserves to be in a class all its own. There is no pleasure so complete as reading a book about a topic you love by authors whose tastes match yours in every particular. I had expected, after reading her memoir, to enjoy Sheila Kaye-Smith’s (SKS) chapters the most and was surprised – but delighted – to enjoy G.B. Stern’s (GBS) just as much. Both women felt similarly towards the six books but even in their agreement they retain their own unique personalities. They are warm and funny and their joy at getting to explore any and every Austen-related topic that catches their fancy is immense, as was my joy in reading. …the young girl’s tragedy is so vividly translated, and she lies on her bed at Mrs Jenning’s house in Conduit Street, with Willoughby’s letters in her hand and ‘almost screams with agony’, unbearable revelation of what someone we love can do to us if their love is not so great as our own, that it does not seem possible ever to dislike Marianne again. Poor child; poor wounded child. Even Anne is not so tormented, for she must always have had a mind to sustain her, even at seventeen; whereas Marianne has evolved no such protection against the storm. Marianne can only rush out in the thin shoes into a damp shrubbery on a rainy night, and thus fashion some sort of fool’s consolation out of rashness. Emma, too, like Anne, has a mind with which to meet grief; she is heavy-hearted, but she is not sunk when she believes she has lost Knightley to Harriet; she can still determine that her father shall feel no effects from her own grief. Yes, Emma, as well as Anne, commands our respect. Jane Bennet and Elinor Dashwood can also meet perfidy and disillusion with fortitude and put on a serene disguise. Elizabeth is given very little suffering to try her; she has but hardly discovered that she could love Darcy after rejecting him than here is Darcy back again; ready to stoop his pride and put his fortune to the test for the second time. As usual, I was in complete agreement with SKS and GBS (for the record, I would rank them as follows: Emma, Persuasion, Mansfield Park, Northanger Abbey, Sense and Sensibility, and, finally, Pride and Prejudice) but I know from past discussions that many of my readers will disagree! I can vaguely understand how people can shuffle the bottom four around but to rank Emma and Persuasion as anything other than one and two (or vice-versa) is inconceivable. This is the Austen book I have spent years searching for. It is intelligent and energetic, quick witted and affectionate. It is, quite simply, perfect. It is interesting that you think of Emma as one of the “not-so-famous” novels. In my experience, most reviewers class it alongside Persuasion as the best of Austen’s books and do devote more time to it than to Mansfield Park or Northanger Abbey, which are doomed to be forever sidelined since they neither Austen’s best nor most light-hearted books. Why? What on earth could this have to do with writing law essays? There’s another Jane Austen ‘literary quizbook’ – by John Sutherland and Deirdre LeFaye – with quizzes at diffrerent levels, but “What is the name of Mrs. Elton’s cook?’ is a question at the easiest level. Much as I love all the novels, I’m doomed. But I did know Miss King! Hoping to find this, because it sounds like just my cup of tea. I have seen that book around but, after reading this quiz, now completely doubt my ability to pass any Austen quiz! I think you would love this book so wish you the best of luck in tracking it down! I am definitely going to have to get “Speaking of Jane Austen.” I love intelligent criticism (am currently reading Virginia Woolf’s essays). I found it interesting that you place “Persuasion” so high, as some people say that, it being Austen’s last book to be written, it is not as thought out as the others. I recently listened to an audio reading of the novel and liked it very much. Anne Eliot seems, indeed, to represent the moral compass that many of us would like to possess, while the persistence of love is a very mature subject. Still, I would have to say that “Pride and Prejudice” has always ranked high with me, next to Emma. BTW: did you see my mention of new books on Austen in your Feb. 12 posting, re “Delicious Snob”? The “Emma” edition from Harvard sounds like one to be acquired, provided one can afford it. I had never heard that particular criticism of Persuasion, Elizabeth. Very interesting. There is no shortage of opinions on Austen, is there? And I did see your emtion of the annotated Emma on that earlier post. I am not a fan of annotated editions (even my tolerance for footnotes in fiction is low) but I know these ones are done very well indeed. With such high praise, I cannot help but seek this one out. Thanks for the detailed review! It is so, so wonderful, Susan! I have a dozen other quotes that I want to (and probably will eventually) share from it that I didn’t get to include here. Oh, well. Off I go to amazon! What a brilliant review, Claire! Oh Rachel, I would LOVE to hear your thoughts on this! Good luck getting a copy. I can completely understand putting P&P third and MP last – as I say, as long as those first two are in the right spots, I can understand any arrangement of the remaining four! Goodness knows my own rankings have bounced around a lot over the years. Lovely review, Claire – and you must relish the good news that there’s a sequel! I read it first, and this one is better, but it’s still great fun to read. I do think the silliest thing SKS ever said was that everyone agrees on a vague order for the books. Persuasion is easily my least favourite; I cannot imagine how anybody would put Pride and Prejudice out of the top two. The debates are much more satisfying, and endless, than she gives them credit! I can’t imagine anything being better than this, honestly, but I am still very much looking forward to tracking down the sequel and reading it! Saying that everyone feels or thinks one thing is the easiest way to prove that they don’t, isn’t it? Silly SKS. When I first read Austen, over 40 years ago, P and P was easily my favourite, reflecting a young person’s delight in the sheer fun of it. While regularly re-reading her over the years, Mansfield Park is the one I now return to the most, reflecting, perhaps an older person’s meditation on the need, and the difficulty, of leading a moral life. By the way, my favourite biog. of Jane, which I have discovered recently, is David Cecil’s 1978 ” A Portrait of Jane Austen” and which I highly recommend. Just found this post and your lovely blog–late to the party, as usual–but your description of Sheila Kaye-Smith’s book was so compelling I ordered a copy. 🙂 This sounds like just the sort of thing I enjoy reading! Thank you for the recommendation.